The unorthodox topping for this easy-to-assemble crumble contains no wheat flour; instead, it features oats and plenty of finely chopped almonds. Use the most flavorful fruit you can find. And don't fuss over removing the peach skins; they're tasty, and the recipe will come together faster if you skip blanching and peeling them. Prepare the fruit: Combine the blackberries and peaches in a large bowl. Dissolve the cornstarch in the lemon juice and toss with the fruit. Pour the fruit mixture into an 8-inch square glass baking dish. Prepare the topping: Place the oats and almonds in the bowl of a food processor and pulse until the oats are finely ground and the nuts are finely chopped (on/off for about 30 seconds). Add the brown sugar, cinnamon, and butter, and pulse a few more times, just to break up the butter. You want a nice, crumbly texture, not too finely ground. 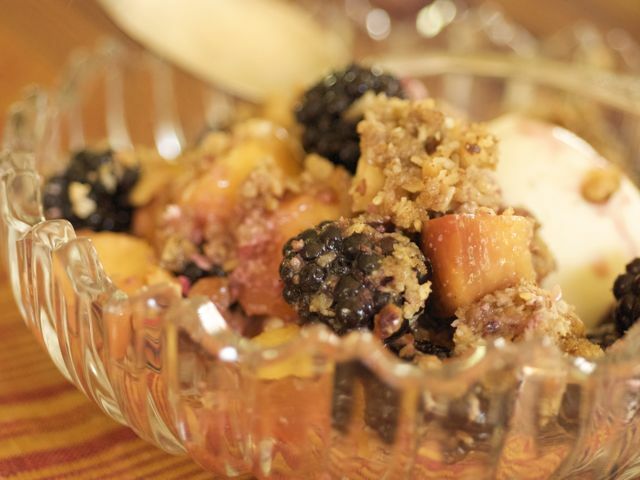 Bake the crumble: Sprinkle the topping evenly over the fruit. Bake for 30 minutes, until the topping is golden. Serve warm, with vanilla ice cream. Toasting almonds: Preheat a large cast-iron skillet over medium heat, then add the almonds and cook for about 4 to 6 minutes, stirring every minute or so. Or spread the almonds in a single layer on a cookie sheet and toast in a preheated oven (350 to 375 degrees) for 8 to 10 minutes, stirring once.